"In the aftermath of civil war, Richard, Duke of Gloucester, makes a hateful resolution to claw his way to political power at any cost. A master of manipulation, subtle wit and beguiling charm, he orchestrates his unlawful ascent by spinning a ruthless web of deceit and betrayal. His staunch ambition soon begins to weigh heavy, as the new ruler finds himself utterly alone and steeped in dread, forced to answer for his bloody deeds and face the horrifying consequences." 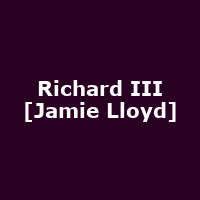 Starring BAFTA Award-winning Martin Freeman (The Office, Fargo, Clybourne Park, The Hobbit, Sherlock, Love Actually) and Gina McKee (Di & Viv & Rose, King Lear, Ivanov, Our Friends in the North, Notting Hill) in the first production of director Jamie Lloyd's brand new season for Trafalgar Transformed. This production of Richard III is recommended for audience members of age 12 and upwards. It contains some scenes of a violent nature.